Located at the quaint village of Bhira in Maharashtra, just a two-hour drive away from Pune, catch a glimpse of the enticing crystal-clear Devkund waterfall, surrounded by green fields and hill ranges. 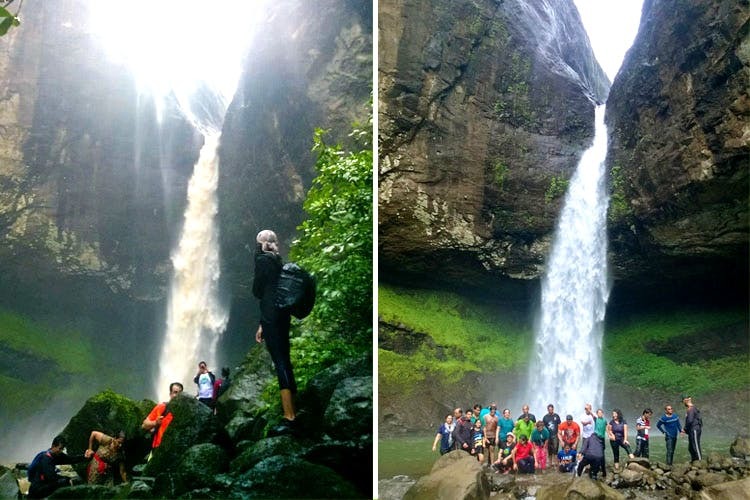 While it is shut for the monsoon, you can plan out an adventurous trek to Devkund waterfalls with the gang after the rains end. Start out early. You need to drive through Swargate-Chandi Chowk-Paud-Mulshi-Tamhini Ghats-Bhira to reach Devkund. The location is approximately 70km from Pune, therefore, the drive shouldn’t take more than two hours. Once you reach Bhira in the Raigad district of Maharashtra, stop for some snacks at the local shacks. Post that, start for your trek towards Devkund waterfalls. It’s a two-hour trek of approximately 4.5km, that is also open to amateurs and is the major highlight of the entire trip. The experience makes you come closer to nature as you witness wide forest ranges, open fields and small streams while you hike along the Bhira Dam. When you finally reach Devkund, it’s a different feeling altogether. The exotic green-blue waters of Devkund and the soothing chill in the air will take away your fatigue almost immediately. Don’t forget to take a dip in to the clear waters and click loads of photographs! You can either opt to go for the trek by yourself or go through travel groups such as Giridarshan Trekking Club in Deccan, the Vatsaru Trekkers in Erandwane and Adventures365 at Katraj. The approximate cost of the trek is between INR 2,100 and INR 2,500.